Bill Gates will manage one of the highest-profile transitions in American business history and computer technology. Before stepping down as chairman of Microsoft (currently $300 billion company that he co-founded over 30 years ago) and moving on to philanthropy, Gates will head a few more high-tech projects and hopefully achieve his goal of bridging the physical and virtual worlds. A secret covert project code named Milan and is 5 years in the making was top secret until recently being unveiled to the public at the Wall Street Journal conference. The project involved transforming an ordinary tabletop into a brilliant, interactive surface with effortless interaction with digital content through natural gestures, touch, and physical objects. A revolutionary aspect of Microsoft Surface is its natural interaction with everyday objects and technologies with an intuitive touch-sensitive 30-inch tabletop with nothing but your fingers. No more computer mouse, keyboards, or wires. 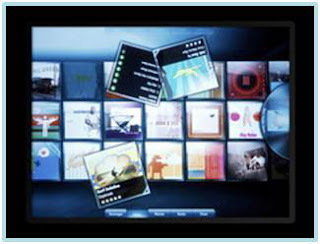 The multi-touch interface allows the user to have hands-on control of photos, music, maps, and more. The coolest feature I liked was the photo resizing and stacking that is similar to Macintosh’s Apple iPhone’s zoom gestures. This idea is nothing new and is not the only company eyeing the new market, but it has never been more than a prototype until recently being exhibited at the All Things Digital conference.. Microsoft Surface made several appearances in movies like the futuristic movies Minority Report and The Island. This new technology, the brainchild of Stevie Bathiche and Andy Wilson, is breaking down the traditional barriers of people and technology by providing an effortless interaction with digital media. It is apart of Intel’s vision of the near future where devices work seamlessly together. This innovative computer has price tags running $10,000 a unit. Microsoft however expects prices to plummet over the next three to five years to the point that it will be available for every home. Direct Interaction: Users can actually “grab” digital information with their hands and interact with content by touch and gestures, without the use of a mouse or keyboard. Multi-Touch Contact: Surface computing recognizes many points of contact simultaneously, not just from one finger, as with a typical touch screen computer, but up to dozens and dozens of items at once. 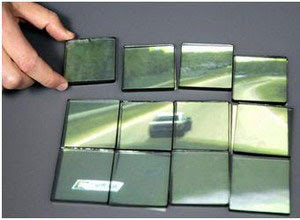 Object-Recognition: Users can place physical objects on the surface to trigger different types of digital responses, including the transfer of digital content. We begin exploring this radical new computer by exploring the components that make up this computer. 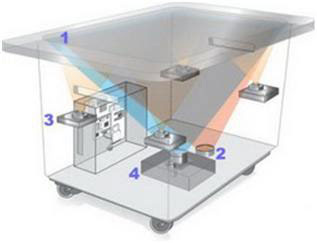 In order to get the table as low as it is, five cameras are used so that each one can have a small field of view. This translates into better resolution and speed (measure in pixels/second) than a single camera with an exceptionally wide-angle view of the table surface. A high-end PC is hidden inside but uses mainly conventional components. Powered by a Core 2 Duo Intel CPU and a “newish video card” running on 2 GB of RAM. Underneath the impact-resistant acrylic plastic screen hides five semi-infrared scanners/cameras, a projector, and a wireless modem. The surface can read a nearly infinite number of simultaneous touches, and are limited only by processing power. The scanners are able to detect movements and recognize objects and shapes placed on the surface. The computer is able to interact and respond to them accordingly. If the scanners recognize fingers, and the fingers have been placed color circles that appear on the surface, the projector sows colored lines that follow the tracings and movements of your fingers. The five cameras are near-infrared devices, but that’s not because they are trying to read heat signatures from fingertips on the table. Instead, its because the entire surface is bathed in light; by illuminating the top of the table, the cameras can easily see when things are placed on it. Shining colored light across the surface of the table would spoil the effect that Microsoft wants, so near-infrared light is used for invisible illumination. The internal modem is able t o send and receive signals from any electronic device placed on top of the surface. With its wired 10/100Mbit Ethernet and wireless 802.11 b/g and Bluetooth 2.0 supports built it, it is already more than compatible with the various devices on the market already. If you place your Wi-Fi enabled digital camera on the table, Microsoft Surface is able to “see” the camera and pull your digital pictures and videos out onto the table for everyone to look, move, edit or send. Images are literally spill out in a pool of color. Microsoft has developed a square tag called a “domino” that can be attached to objects so that Surface can interact with them on the fly. Instead of relying on RFID, the domino tag uses dots to encode its information (hence the name). There is a single do in the center of the tag, three dots on one side for orientation, and space for eight more dots that are read as data. Essentially, it’s a one-byte data tag. All of the hardware is run by a special version of Microsoft’s new operating system, Windows Vista. Surface applications can be written in Windows Presentation Foundation or XNA. The development process is much like normal Vista development, but custom WPF controls had to be created by the Surface team due to the unique interface of Surface. Developers already proficient in WPF have been trained in the idiosyncrasies of writing Surface apps and should be available to customize Surface deployments. This is assisting in the transition from DOS to GUI. When something like a wine glass is set on the table, Surface illuminates the edges of the object with a soothing glow and can display information, pictures, or decorative graphics next to and around the glass. When the glass moves across the table, these items follow it. The possibilities for such a device are staggering, especially when it drops in price and enters the home market. It’s even possible that consumer electronics could be tagged at production. To operate the 22 inches high and 42 inches wide Microsoft Surface computer, all you have to do is reach down, touch it, and push it. To make the image you see on the screen bigger, spread your fingers. To make it smaller, squeeze your fingers together. To move something into the trash, push it into the trash with your hand. This new interface allows to paint with a real brush, play cards with your hands, and pay your bills just by putting your credit card on the surface of the display. 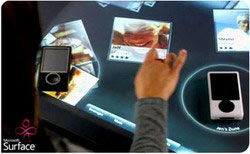 Microsoft Surface also allows what is being called Multi-Touch and Multi-User interaction. This means that more than one individual can interface with the computer simultaneously. With the Microsoft Surface, that doesn’t mean a few, it can support dozens and dozens of fingers at once. The first people/companies to get their hands on these are partners T-Mobile USA, Starwood Hotels and Resorts, and Harrah’s Entertainment. 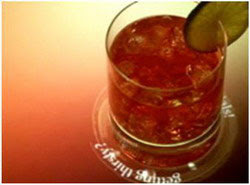 Hotels, retail stores, and restaurants will easily adapt to this technology and make use of this new technology. T-Mobile plans to adapt the technology by allowing customers to place any cell phone(s) onto the surface and then view a detailed display of the product(s) information. This makes it easy and ideal to compare various phones at once and easily keep or remove your choices. Consider all your options for possible mobile telephones with all of the products information at hand. Harrah’s is also exploring the idea of integrating further options for ordering food and beverages, and possibly gaming or game-related activities. Starwood plans to make the machines available in public areas of select Sheraton properties, including in Seattle, starting later in 2007. Starwood is exploring the possibility of users being able to select music through their personal playlist, share photos, ordering food and adapting a virtual concierge idea. Harrah’s plans to start using the surface tables as a “virtual concierge” desk in conjunction with its Total Rewards loyalty program at its eight Las Vegas properties, which include Caesars Palace and Bally’s. People will be able to use the tables to access maps of the different properties, get details about events and venues and create itineraries for themselves. The tablet PC was the conceptual forerunner to the new machine. However, the tablet pc failed to capture the consumer market as much as Microsoft Chairman Bill Gate predicted. Project Milian was the first product from the Surface Computing team, a hitherto unknown group that has grown, under the radar, to 120 people. The company says the product’s genesis came in 2001, arising from brainstorming sessions between Andy Wilson of Microsoft Research and Stevie Bathiche of Microsoft Hardware. Wilson has shown certain elements of the surface-computing technology publicly, as has Bill Gates. Most of the products details are now unwrapped. Visionary Bill Gates has been touting alternative forms of computer-human interaction for years, such as tablet computing and voice recognition. Now the result of six years of collaboration between the company’s hardware and Microsoft Research (MSR) will have the opportunity to reap the rewards and bask in success if all goes according to plan. 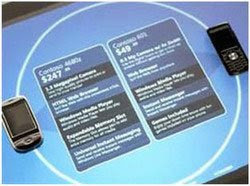 Microsoft Surface plans on achieving much more and not sharing the same fate as the Tablet PC. Pete Thompson, general manager of Microsoft Surface Computing, plans on this section of the company becoming a multibillion-dollar industry. The goal is have this technology to adapt to everyday life and be pervasive – not just a novelty computer. Price will be a major obstacle for the new machine to overcome if it is to catch on with mainstream computers. Like all of the latest gizmos and gadgets, prices start out high and quickly drop as the computer becomes “out-dated”. Current projections for the unit range from $5,000 to $10,000. With this price range it could be years before it is available to the consumer market, but Microsoft plans on this happening much sooner. 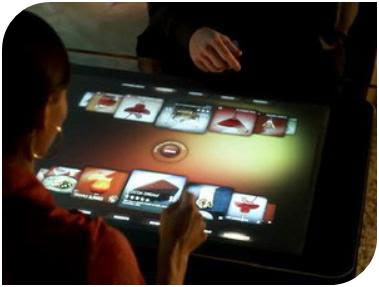 Microsoft envisions the Surface technology being used in restaurant settings. Mark Bolger, director of marketing in Microsoft's Surface Computing group, shows a photo application that pulls digital images from a remote server and then lets users move them around the tabletop -- and resize them -- with their hands. Bolger demonstrates a virtual painting application. One of the customers that will be using Microsoft Surface is wireless service provider T-Mobile. In this demo, Microsoft's Mark Bolger shows one of the ways that the technology could be used in a T-Mobile retail store.